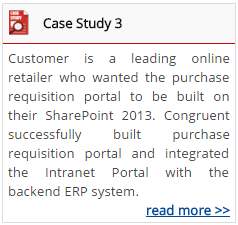 What makes Congruent a preferred SharePoint Partner? SharePoint Consulting - Congruent provides end-to-end SharePoint consulting services to small, medium and large enterprises. We focus more towards business processes of our clients and provide SharePoint implementation services accordingly to maximize their ROI. SharePoint Implementation - Congruent has the perfect blend of highly skilled SharePoint professionals who can efficiently address the implementation requirements for companies of any size. To our credit, we have a lot of successful implementation projects on SharePoint versions like 2010, 2013 and 2015. Our rich hands-on expertise in SharePoint implementation, coupled with our framework of processes and practices ensures effective design, development and deployment. SharePoint Upgrade - Congruent has successfully executed SharePoint upgrades for enterprises from older versions to SharePoint 2010/2013/2015. SharePoint consultants evaluate all new features of the target SharePoint versions (2010/2013/2015) and match them up with client’s business process to implement the required features that best suits client’s business needs during upgrade. BI / Executive Dashboards / Score Cards - Executive dashboards delivers an unlimited experience for management to monitor their business operations in real time. Congruent excels at configuring and implementing executive dashboards and BI on SharePoint effectively for the purpose of report generations or analysis. SharePoint Add-on Development - With its large offshore software development center, Congruent helps ISVs and SharePoint partners in SharePoint app development, customization, development, upgrade, add-on product development and integration with other systems. Congruent also offers SharePoint resources on retainer basis to act as backend consultants and development team for ISVs & SharePoint partners. SharePoint Branding - SharePoint development resources at Congruent has the exact mix of knowledge & experience to build creative designs. Since design and branding are the primary essentials of any SharePoint implementations, Congruent is dedicated towards providing innovative SharePoint Branding services. Our SharePoint team works towards achieving our client’s vision by building them a seamless, user-friendly, and intuitive design which makes sure that users derive the most value from SharePoint with enhanced user experience. 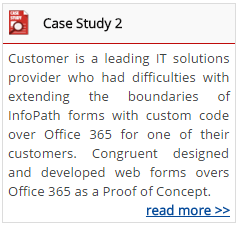 External Systems Integration - SharePoint development team at Congruent has rich experience in integrating enterprise applications (ERP/CRM systems) with SharePoint through connectors (Both OOTB and custom connectors). Such integration aspects help clients break departmental silos and build effective workflow mechanisms and streamline processes across various departments within an enterprise. 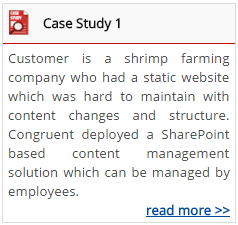 SharePoint Support - Congruent provides flexible SharePoint support services to help you leverage the complete potential of Microsoft SharePoint and to ensure the smooth operation of your SharePoint environment. Our team of experts can assist you with technical/administrative guidance and continuous support to overcome all the major challenges associated with the application. For further queries or to express your interest in our SharePoint consulting, implementation, migration, app development, integration or support services, please fill in the enquiry form for us to touch base with you. .